This is a fully furnished modern office building offering a range of flexible business accommodation. A high standard of offices / storage / workshops units with onsite maintenance, meeting rooms and 24-hour access. Warrington and Manchester are six miles to the west and north east respectively. There is also easy access to Manchester Airport, perfect for business travel, and there are various hotels in the area. Offering a creative mix of private offices and open plan design, this centre empowers members to produce great results and socialise throughout their working day. It boasts a welcoming breakout lounge that you can make use of during your breaks, as well as meeting and conference facilities, all accessible 24 hours a day. The centre is located in the thriving market town of Altrincham, just off the M56 directly opposite the tram and bus station. 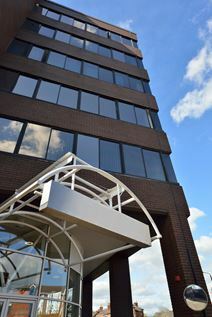 Bespoke office suites within a single multi-storey building in Altrincham in the Trafford Borough. Offices are accessed by a secure boutique-style reception designed to a high specification offering air-conditioned space, communal meeting room and lift to all floors. Secretarial and concierge services are also offered. Centrally located, the property offers access to excellent transportation links being just 5 minutes’ from Altrincham’s main train station and offers easy access to Greater Manchester and Liverpool. 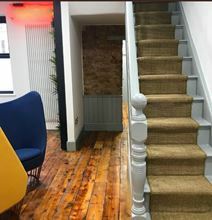 Located in the centre of Altrincham, this centre offers both private suites and coworking space for younger businesses, start-ups and freelancers. The centre boasts an array of amenities to make your day as business-focused as possible, including fast internet, meeting room facilities and free beverages. Tenants will have access to the centre 7 days a week, and will be able to take advantage of an excellent location. Altrincham Interchange - offering rail, bus and Metrolink - services is just a four-minute walk and the nearby Stamford Quarter boasts a wealth of eateries and stores. Flexible serviced offices to let in this landmark building situated in the town centre across the road from Altrincham station. Meeting rooms and on-site team available with options available to expand and/or relocate to leasehold space either elsewhere in the building or anywhere in the landlord’s portfolio of over 90 buildings. A short walk away from shops, restaurants and other amenities with underground parking available and quick links to the M56 and national motorway network. Manchester Airport is 6 miles away. Conveniently located within walking distance of Altrincham town centre, this business centre offers 3 large office spaces, modernly furnished and technologically equipped. These spaces are available at flexible rental terms and benefit from direct access to the motorway network and to Manchester Airport and are well served by public transport. The space offers car parking, ideal for those commuting by car.